The Codabow Diamond SX Viola Bow is a technological tribute to history's fine bows. Merging the traditions of bow making with the advancement of technology and the materials of today, the Diamond is now regarded as one of the best Carbon Fibre bows available. The SX Model has been described as sophisticated and reliable, whilst also being accepted as the ideal bow for touring professionals and teachers. The SX bow has a natural finish, and features nickel-silver mountings, along with gold medal stallion hair. Also featured is an Xebony frog with natural carbon-fibre weave slide and a graphite diamond weave. 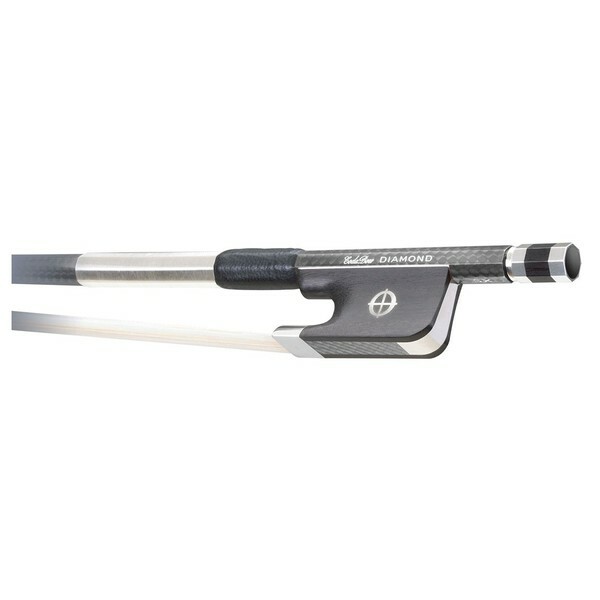 The SX viola bow has a Kevlar acoustic core capable of producing high quality tones. The diamond series bows have been precision engineered to provide a quality bow for professional musicians. The graphite diamond weave helps create a balanced stick offering the agility of all wooden professional level bows, whilst encouraging good technique to help the performer develop further. The Graphite Diamond Weave is woven using Codabow's traditional design, producing the highly sought characteristics, strength and balance. The fibres extend from the button to the tip of the bow, ensuring an evenness of balance across the entirety of the model. The pure kevlar acoustic core fibres which run through the bow help to provide more power in the bowing action, whilst still offering the natural sensitivity and tonal characteristics of fine Pernambuco wood. Made by Walter Paulus, the traditional frog design features one of the only alternatives to the threatened supply of ebony, which has been named Xebony. This material provides a natural feel which continues to impress bow makers and performers alike.